Sumiya is a frame, two story building roofed with tile,copper plates and shingles. It has three main parts: the lattice work exterior and entry way, the huge, open kitchen,and the interior rooms. Its floor space is 1,119 m2 and its site measures 2,483 m2. It is the finest extant example of Edo Period (l603-1868) ageya architecture. An ageya was an elegant restaurant where banquets and dinner parties were held accompanied by the entertainment of geisha and taiyu (premiere geisha), who performed tea ceremonies, sang and danced. The geisha and taiyu lived and were employed at establishments called okiya from where they were summoned to the ageya. Sumiya is a surviving masterpiece of the ageya architectural style. In 1952 it was designated by the government of Japan an Important Cultual Property. The ageya architectural style combines shoin-tsukuri and sukiya-tsukuri features. Shoin-tsukuri is the elegant, formal style of the warrior class,featuring spacious rooms, elaborate carving and beautifully painted walls and sliding doors. The sukiya-tsukuri is the delicate, informal style of the tea ceremony room, using materials in their natural state and subtle, informal refinement. Ageya architecture was a creation of the rising class of urban merchants and artisans: plain on the exterior but sumptuous within, elegant and spacious like palaces of the samurai, but refined and casual like tea rooms. The Nakagawa family has owned and managed sumiya for 13 generations, since 1641. In 1641 the entire Shimabara entertainment district including Sumiya, was ordered by the Shogun to move from its former site at Roku-jo-misuji-machi, Kyoto, to its present location. In 1787 Sumiya was expanded to about its present scale. Because of its location in what was once the entertainment district of old Kyoto, Sumiya is sometimes seen only as an example of the decadent amusements of a former age. This view is short sighted. Sumiya was not merely a house of entertainment but functioned as a meeting place and cultural salon where famous men in the fields of art, literature and politics gathered. 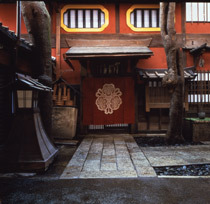 And because there are no surviving play houses or other similar structures in Tokyo, Osaka or Kyoto,Sumiya is the finest extant example of Edo Period popular urban culture of the merchants and artisans.Compared to the many surviving examples of temple and palace architecture of the elite classes, the interiors of Sumiya surprise us with their freshness and originality. Here the tastes and style of the city dwelling shopkeepers and tradesmen was emerging onto the stage of history. We can still sense its vigor and creativity after 300 years. Sumiya also figures prominently in several phases of Edo Period artistic and political history. Its sliding paper doors and folding screens are decorated by some of the greatest artists of the Mid-Edo Period, such as Yosa Buson (l716-84),Maruyama Okyo, Kishi Ganku (1756-1836), Yamada Gazan and Emura Shumpo. Among these works is the famous National Treasure, "Plum Blossoms", by Buson. At that time Sumiya was also a meeting place of the well-known haiku group called Shimabara Haidan (haiku are seventeen syllable Japanese poems). The sixth and seventh generation proprietors of Sumiya were friends of Buson, Taigi and other notable haiku poets of the era and collected the works of these masters. Many of these masterpieces are still preserved in Sumiya's archives. The historical significance of Sumiya is not limited to these examples. During the final years of the Edo Period the well-known political reformers Sakamoto Ryoma (1836-67), Saigo Takamori (1827-77), and Kusaka Genzui (1840-64) invited the rich merchants Konoike and Kashimaya to Sumiya in order to raise funds to restore the Emperor to power. With this rich heritage in mind, we hope you will be able to appreciate better Sumiya's significance for Japan's history and culture.